The moon's Messier crater region contains three separate impact sites, including one with large butterfly wings. Unusual butterfly-shaped craters on Mars, Mercury and the moon may provide insights into the surfaces of the three worlds, and even suggest the presence of a third moonlet that may have once orbited the Red Planet, new research shows. The research comparing these butterfly features across all three solar system objects is helping to pin down the bodies' similarities and differences, and helping scientists understand conditions on the worlds when material crashed into them and created these insect-like patterns. "The combination of these two [features] gives us what looks like butterfly wings," Robert Herrick, of the University of Alaska Fairbanks, told Space.com. Herrick used updated observations of Mars, Mercury and the moon to make a more complete survey of objects that hit the surfaces at low angles, forming butterfly craters and other unusual shapes. He presented his results at the Lunar and Planetary Sciences Conference in The Woodlands, Texas, in March. NASA's Viking orbiters collected images of butterfly craters on Mars in the 1970s, while Apollo missions captured signs of similar craters on the moon in the 1960s and 1970s. The elongated, oval bodies of the craters themselves revealed the low angles of the impactors, which smashed into the ground at relatively low speeds. As they plowed into the surface, they blew material into the air. The ejecta pattern on this Martian butterfly crater formed as blown-off material created two "forbidden zones" in front of and behind the crater in which nothing fell back to the surface. The resulting debris left a butterfly pattern. But the debris doesn’t fall evenly around the site. Slow-moving, low-angled impacts create "forbidden zones," or wedge-shaped regions in front of and beyond the incoming object with no ejected material. While ejecta falls heavily to the sides, the ground in front of and behind the impactor remains clear of debris. The result is the unusual butterfly shape. While laboratory experiments have re-created most of the butterfly shapes observed in nature fairly closely, Herrick said they aren't perfect replicas. "We're still working to figure out what's going on," he said. Replicating the downrange forbidden ones in the lab remains a challenge, one that Herrick suspects is related to the material on the surface, he said. Material blown into the air by the impact can be rapidly melted or vaporized, which affects how it falls back to the ground. Herrick suggested that the presence of ice beneath the Martian surface may affect the way material falls back to the surface around elongated craters. Detailed observations of the craters and their features may help to solve some of the mysteries surrounding them, he said. In the decades since NASA's Apollo and Viking missions, space agencies have sent other missions to visit the three rocky worlds. 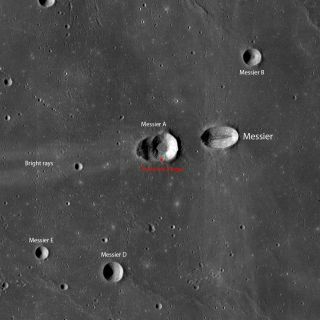 Herrick examined images of Mercury from NASA's MESSENGER spacecraft, as well as more detailed images from multiple lunar and Martian missions, to make a more complete list of the population of unusual craters. He compared some of the most well-preserved craters to one another to see how the features differed across the three worlds. Due to the active erosion from wind and (in the past) water on Mars, most of the Red Planet's unusual craters are degraded, Herrick said. However, because Mercury and the moon have essentially no atmospheres, their craters tend to remain more pristine, he said. At the same time, Mars is the largest of the three bodies, and this affects how much material is gravitationally pulled toward its surface. As a result, it has a higher population of elongated craters. After cataloging a handful of the better-preserved elongated craters on each world, Herrick found several similarities. In all elliptical craters, the deepest parts of the craters on each world are usually closer to the back end than to the front. In butterfly craters, there's always at least a small rim at the "back" of the crater that rises above the surrounding terrain. An elliptical crater in the Hesperia Planum region of Mars, captured by the European Space Agency's Mars Express. He also found that Mars has more of the elongated, "tear-drop" shaped craters, that are stretched out even farther than most. While he was able to spot at least one similar crater, Torricelli, on the moon, he could not find a comparable crater on Mercury, he said. "This is a rare subset of a rare subset of the crater population," Herrick said. "Maybe … only really slow impactors make these types of craters, or [maybe it's] something else. "I don't have a good explanation," he said. In the future, he hopes to utilize 3D models to better track the ejected material and learn more about how everything moved during and after an impact, Herrick said. These models can help provide insight into the conditions beneath the surface, he said. In addition to comparing the populations of craters, Herrick also examined a few of the most well-preserved impactors. In a previously published study, he and his co-author found that a dying moonlet may have carved one of Mars' butterfly craters. As the small object spiraled into the planet, the impactor's pieces may have excavated two end-to-end craters on the surface, producing a butterfly ejecta. In fact, when the Martian moon Phobos spirals to its death within 50 million years, it may carve out a similar pattern. Previous models have suggested that the moon is unlikely to slam directly into the planet, but will instead slowly spiral inward, and will probably crash at a low angle and velocity. "Phobos, when it spirals in — and it's a pretty big body, so it should make a pretty big crater — it should make a nice butterfly crater," Herrick said.